If you are one of the many impatient Apple fans from outside the US who have imported a 3G iPad, you will no doubt be more than familar with the lack of micro-SIM cards available on the global market. Fear not, as with some steady hands and a sharp instrument or two you can have your very own mini sim in minutes. UK-based iPad importer John Benson recently received his new 64GB 3G iPad and quickly got to work on shaping a SIM card that worked for him. In his simple guide, John details how to take a regular common SIM card and give it the slimming treatment to make it micro. 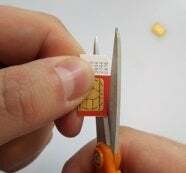 His guide takes a regular sim and through the use of scissors and a knife chops it down by 52% in order to make it the required micro size that fits within the iPad. You can see more pictures of John's chopping antics on his Web site. Perform this operation at your own risk; we're not responsible if you render your SIM card useless! Like this story? Share the love!